Liminal places are where ancient gods await and human beings are touched by the Divine. What is the function of such places in the landscape and how can we open sacred space intentionally to facilitate healing, rites of passage and to breathe new life into the teachings of the ancient mystery schools? Imelda talks about work done with groups in Andalucia, Spain, New Mexico (USA) and women receiving their own profoundly personlized Rites of Passage from Spirit on her sacred art program in London! LA-based film maker Hannah Beadman made a wonderful film called THE TIME TRAVELLERS in 2014 where we see young people on camera receiving a toolkit and strategies for dealing with and resolving bullying from their own spirit allies. During a sunset walk in the snow, one afternoon in Sweden, the star constellation Orion appearing gave me a powerful vision that involved the primordial giant of Norse mythology: frost giant Ymir. Cadmus was credited with introducing the letters of the Hebrew of Phoenician alphabet in Greece. Others say that the god Hermes (or Mercury) invited the alphabet by watching cranes fly.Palamedes invented four letters, inspired by flying cranes to complete the Greek Alphabet. In alchemy five birds play a special role because they represent key stages of the alchemical process and this is really the process of soul making.... Today we "tweet" on Twitter but do we realise that the Language of Birds used to be perceived as divine speech: utterances of the gods?! In a dream I had in Sweden summer 2017 I was shown the soul journey of a Swan Maiden and her infant son after she died in childbirth. I was mystified and did some research. This took me to the town of Vedbaeck in Denmark, just north of Copenhagen. In 1975 a Mesolithic era cemetery was discovered here. The body of a young woman (aged about 18) was found with the body of a premature baby boy. It is presumed that she and her son died in childbirth. The baby was cradled in a whooper swan wing and he had a flint knife by his side. His mother had grave goods with her, such as ornaments made from shells and the teeth of animals such as bear, deer, elk and boar. Both bodies had been sprinkled with red ochre. It is believed that the swan’s wing indicates an ancient belief in swans as soul conductors or psycho pomps, accompanying people on their transition to the otherworld. I was touched to my very soul because I realised that my dream had showed me the continuation of their consciousness after death, for these two souls. It also led to delving and dreaming into the significance of swans in Early Europe and this art video shows some of my discoveries. This art video explores the role of a very ancient Northern European goddess, called Frau Holle, in her role as soul conductor for children. There are many reports of her roaming the land and night sky accompanied by the spirits of dead children. This phenomenon is called The Wild Hunt. In Middle Dutch the name of the Milky Way was Vroneldenstraet: the street or highway of Frau Holle. She is also known as the Hyllemoer or Elder Mother and closely associated with the spirit of the Elder Tree. As a new religion called Christianity took over, Frau Holle became feared, even demonized. Her crucial role: patrolling the liminal zone between Life and Death was no longer understood. Her deep compassion for life, especially young life, was no longer felt. Frau Holle deserves to return to our collective consciousness and take her rightful place as one of the most ancient goddesses of Old Europe! In the year 2016 a mysterious female figure visited me in a dream - it was The Poison Mother, an ancient Mistress of Transmutation. It took me a year and a day to fully absorb and "unwrap" her message: to be a crucible for the mutation of poisons in our world. This film maps my journey of discovery and shares her invitation with others! 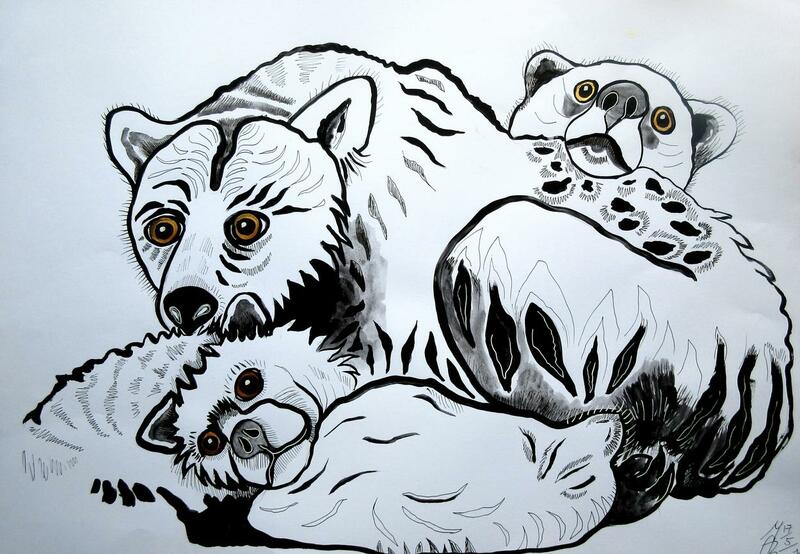 This short art video is about the Dreaming of a Mother Bear. On another level it is about dissolving separation between humans - animals, self - other, ancestors - future generations, inner world - outside world and so forth. In the final reckoning this short film is my living will as it communicates my wishes for my own death and beyond. It is set in Sweden, in the location where I will be teaching my courses in Norse Shamanism from Summer 2019! This art film explores the ancient, ancestral and archetypal yet mysterious figure of The Woman and Her Snake. The ancient text Fjölsvinsmal in the Poetic Edda tells us that there is a Mountain of Healing or Medicine Mountain in Norse Shamanism where a mysterious goddess resides, surrounded by Nine Maidens or Disir (female ancestral spirits). Climbing this mountain can bring healing miracles, no matter how ill or "dis-eased" a person is. In 2016 the Nine Maidens of Lyfjaberg called me to undertake an apprenticeship with them. This art film describes some of my sacred journey and pilgrimage up the Mountain. I hope this will inspire others to climb Lyfjaberg in search of healing, wholeness and holiness. With special gratitude to Ulrika Jäger for reminding and teaching me about the Maidens of Lyfjaberg! A Divine Animal Mother came to me in Sweden during the Winter Solstice period of 2016. She touched my soul and cracked me wide open. I embarked on a journey that required me to release many beliefs I previously held about Divinity. 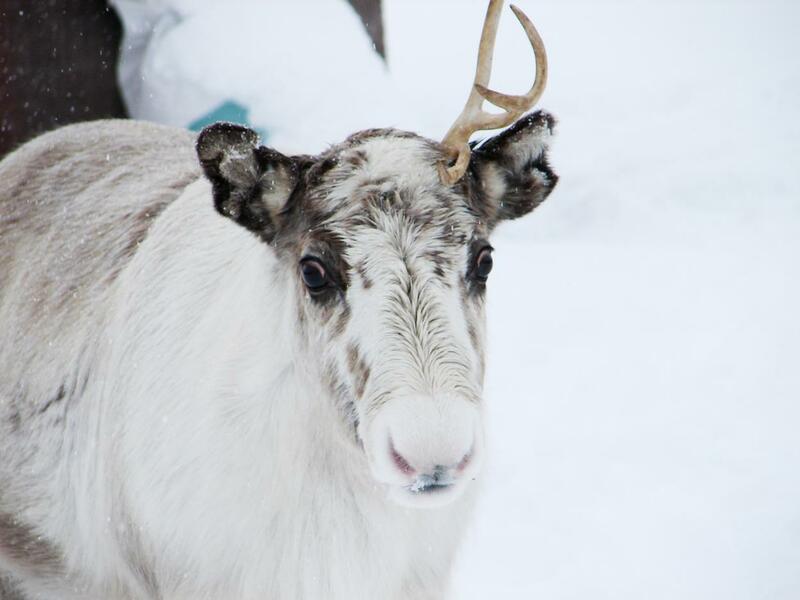 Then I discovered that the indigenous peoples of Siberia know this Reindeer Mother very well! This art film explores shamanism, gender crossing and the cosmic dance of sacred feminine and sacred masculine through the lens of two Sami deities: Bow Woman (or Juoksakkha) and Alder Man (Leibolmai). Shamans are explorers of the psyche and they have always crossed social, spiritual and gender boundaries. We think of the souls of people who die, stillborn babies or even through miscarriages as "completely gone" or in a place where we cannot contact them (assuming we believe their soul is eternal and they live on in some way or form). In the early 19th century In the early19th century the native Chumash and Tongya people were forced to leave the Channel Islands off the coast of California. They were taken to Spanish missions and pueblos on the mainland. One teenage girl ran back to look for her baby and the ship left without her. She lived alone on San Nicholas Island for 18 years, when she is 'rescued'. Her name was Juana Maria. She appeared to me in a dream and showed me images of her life in those 18 years of profound solitude. She appeared as a Seal Woman (in Europe we would say "Selkie") who became a great shaman and the Seal Mother of Souls over time. She developed an intimate relationship with the Moon, the stars, the seals and the whales passing on their epic migration journeys. My small film does not claim to portray 'the truth' about Juana Maria's 18 years alone on San Nicholas Island. We will never know for sure. (When she was 'rescued' after 18 years she had no language in common with the people who welcomed her to the mainland). What I do know is that a powerful Seal Woman and Shaman invites us to dream with her, her seals and her spirit child. As an Apprentice of the Waning Moon, I needed to walk into the Desert to find the wide open spaces within myself. This film shows how that journey unfolded after Six Maidens appeared in a dream and told me to go looking for the mysterious Seventh Maiden. As the external journey unfolds through extraordinary landscapes the inner journey of soul making occurs at the sane time. Along the way there are encounters with Kokopelli (Fertility Deity and the Spirit of Music) and The Man In The Moon. This film explores he essence of creativity and keys to creative flow. It also explores how dreams offer a window on greater truths and mystery. Sedna is the Sea Keeper and Mother of All Sea Animals, an Inuit goddess venerated (and feared) by all Inuit tribes. When human beings transgress, violate animals or break taboos, Sedna cooks up fierce storms and withholds game. The result is Death, Darkness and Starvation. A Shaman then needs to undertake a dangerous journey to the bottom of the Sea to comb out Sedna's hair (to free the entangled animals) and to appease her until she releases all animals. Western culture has lost both shamans and the awareness that to live in harmony with all sentient beings, we need to communicate closely with gods, goddesses, spirits and other inhabitants of all worlds, seen and unseen.This short film sees Sedna setting out to investigate what is shaking her watery world, what humans are doing to the Earth and all animals, especially whales. I invite you to watch the film to find out what happens! I had a recurrent dream about being in a place "where the forest meets the sea" and painting in nature, surrounded by trees. In the dream there were whales in the sea and there were strong native traditions and arts on the land. Sony Baron and David Crumpton made the dream reality by inviting me to Vancouver Island. I found myself in the landscape of my dreams, in my "soul scape" you could say, painting in the rain forest, with hummingbirds fluttering around me. Gnosis of the Earth is a Rock Art Seminar in southern Andalucia, Spain, where geomancy, shamanism and sacred art all meet in one place. This course was visioned and created by Imelda Almqvist in partnership with Karmit Evenzur who is a long term resident of Andalucia. On this course we connect with the Spirits of Place and ceremonial experiences ancient peoples had on this land. Hunting magic and fertility rites inspired ceremonies that kept the land, animal and human population healthy and in sacred balance. In this seminar we "taste Dragon's Blood" to be initiated into The Green Language or Language of Birds. The Laguna de la Janda is a powerful liminal place, where two oceans and two continents meet and where migrating birds rest on their journeys north and south. We visit caves, the womb of Mother Earth and make our own rock art. Soul Flight occurs. This powerful seminar defies expression in words - it can only be experienced! Welcome to the old Laguna de la Janda - we hope you will join us one day! - Karmit Evenzur is a wellknown geomancer based in Spain and Imelda Almqvist is a teacher of sacred art and shamanism based in London, UK. 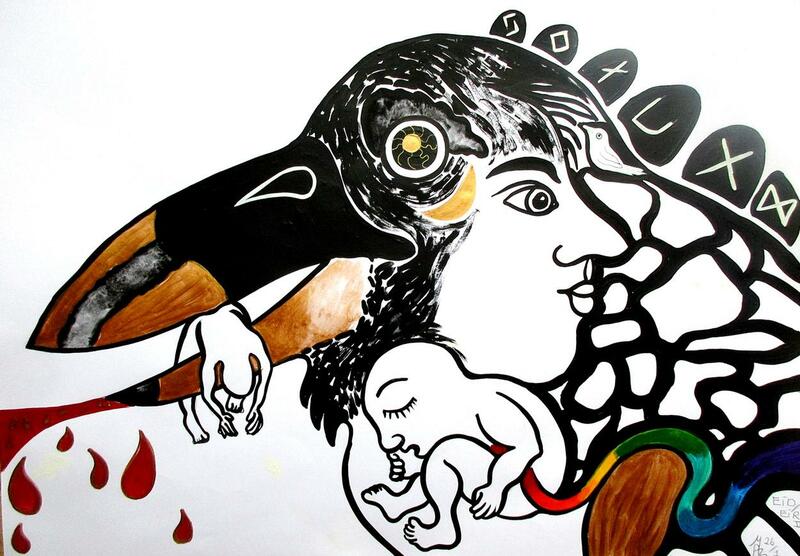 This short film is an exploration through paintings and drawings of her own dreams, Inuit Myths and traditions. At times we need to dream in black and white to see more clearly or to see in the Dark! In this film White Bear appears and he is really a shaman in disguise, roaming the universe. He takes the artist to a place where Time freezes along with the Ocean when The Great Darkness comes and many magical events unfold. The boundary between dreams and reality dissolves. There are encounters with animals, wind spirits, snow spirits and beings from other realms. It is my hope that this film will urge people to honour and preserve the wisdom and culture of the Inuit and that people will start dreaming on their own spiritual lineage. I was born in the Netherlands (maiden name: Imelda Berendsen) where I never felt at home. My adult life has been a great journey exploring where my spiritual home is. The place my soul calls home is in The Far North: Greenland! I had a recurrent dream about being in a place "where the forest meets the sea" and painting in nature, surrounded by trees. In the dream there were whales in the sea and there were strong native traditions and arts on the land. Sony Baron and David Crumpton made the dream reality by inviting me to Vancouver Island. I worked from a place of deep listening so many stories came to attention and told themselves. Some of those stories and myths formed the material for this film. This is the third and last film made after an artist's residency on Vancouver Island in 2015. 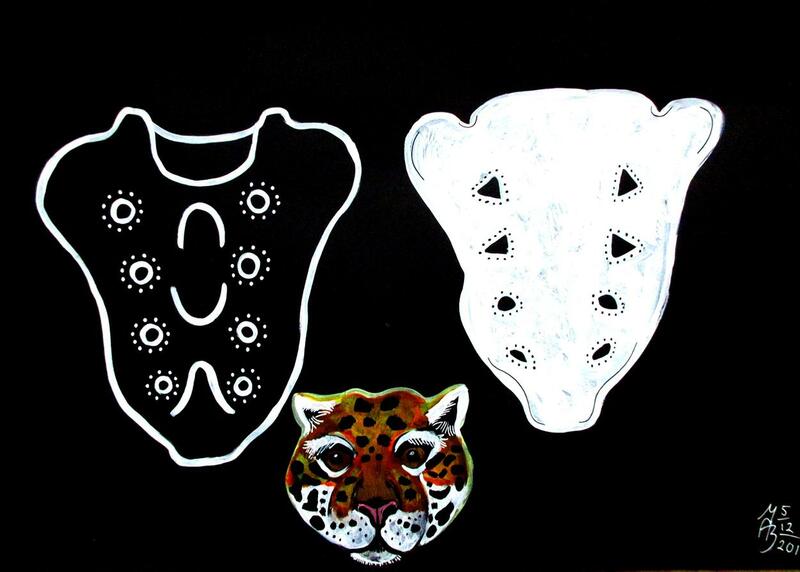 Shape Shifting is ancient art practised in all shamanic cultures. The process of shape shifting is at the very heart of Creation. All that is, shape shifts and transforms, moving through the great cycles of Birth, Death and Rebirth. This short film tells the story of Fire Bird. She embodies the gift of a unique day on Earth, the marriage of opposites, the sacred marriage of Life and Death. She is the Spirit of Celebration and Rebirth. With huge gratitude to Sony Baron and David Crumpton for making the dream come true! This video shows paintings by Imelda Almqvist set to music by Anja Lechner (cello) and Vassili Tsabropoulos (piano). The composer is Gurdieff and the the name of the song is Chant from a Holy Book. This is one of most beautiful CD's I know and many of my friends and clients have ended up buying their own copy! This is the first video I ever made after discovering Moviemaker on my computer. (The second one was SPIRIT CHILDREN). It is paintings set to music - but people have told me that they enjoyed it. WHAT IS SHAMANISM, SOUL RETRIEVAL AND SACRED ART? Please note! Due to a power cut in the Denver Area this interview was cut short!